Let me guess—even though your complicated printer environment is the source of constant headaches, the thought of deploying a new solution enterprise-wide sounds even more painful. 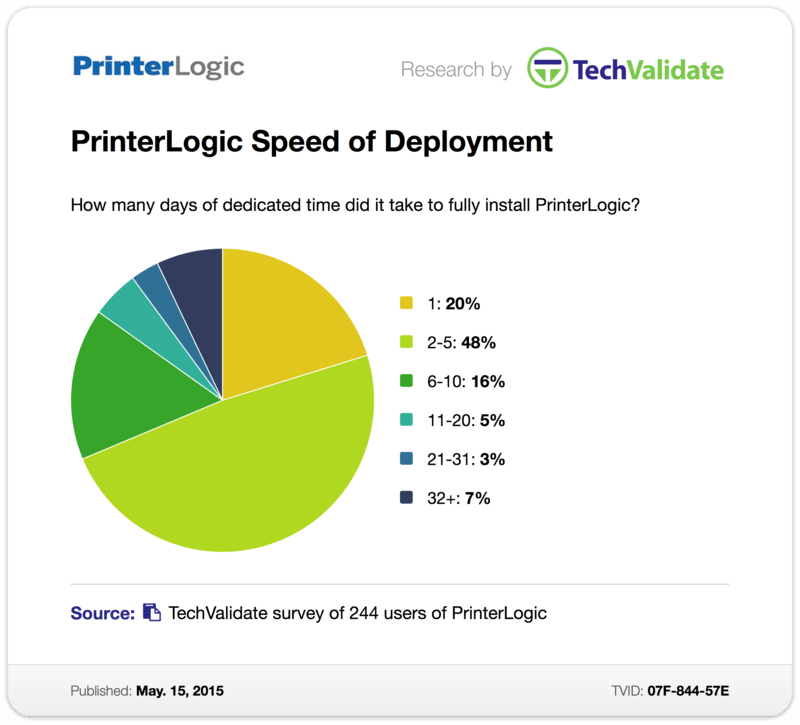 But what if I told you that a recent TechValidate survey of PrinterLogic's customer base revealed that 68% of our customers were able to fully deploy our solution in under five days? And that a whopping 90% of them were able to deploy in under 20 days? Taking into consideration the size of our clients' organizations (see Are We Too Big to Eliminate Print Servers? and Eliminating Print Servers in Distributed Offices), this might seem like a monumental feat. But with PrinterLogic's enterprise printer management solution, rapid deployment is just business as usual. How so? Let's start with the install itself. During the initial setup process, PrinterLogic automatically installs the IIS role, PrinterLogic web application, and database on Windows Server 2008 R2 (or newer) at your organization’s data center or HQ. After that, all your existing printer drivers, port settings, device settings, and preferences are copied from your print servers into PrinterLogic—with zero changes. Finally, you’ll deploy the tiny (3MB) PrinterLogic client silently to all workstations. This takes care of the hard work, automatically and seamlessly converting existing printers on print servers to direct-IP printers that print directly to the physical printer. Oh, and I should probably mention that all your printer settings—like defaults and paper tray preferences—will carry over automatically. All those hours you've invested in customization won't be wasted. Then comes the truly rewarding part: Unplug your print servers across your organization and carry on printing just like before. Only now you'll notice that the folks on the service desk suddenly have a lot more time on their hands. With such straightforward steps, it's no wonder that more than two-thirds of our customers are able to eliminate print servers altogether and migrate to PrinterLogic in under five days—or that 20% of them can get it done in just one! But rapid deployment doesn't stop after you've managed to get PrinterLogic up and running in record time. In day-to-day operations, PrinterLogic allows you to dynamically deploy printers by OU membership, container, computer, user, AD group or IP address range—and without cumbersome GPOs or scripts. And the automation is discreet: printer installation happens after logon, which avoids slow logon processes. You can even have nearby printers automatically installed through proximity printing. Support for virtual technologies like Citrix and VMware goes without saying. And that, we think, is the great thing about PrinterLogic. The remarkable speed and ease of enterprise-wide deployment in as little as one business day isn't a fleeting pleasure. It's more like a blissful prelude of everything to come.